My eyes stung from the dust and chemicals stirred by a recent dynamite explosion; I sweat profusely under the protective clothing and hard hat I’d been given. Despite both a dampened face mask and bandana meant to ease respiration, I could still barely breathe. The crush of claustrophobia began to creep in as we crawled through one tunnel after another, descending ever deeper. At several points, all I could think about was how much longer it would be until we reached the exit with its promise of daylight and fresh air. 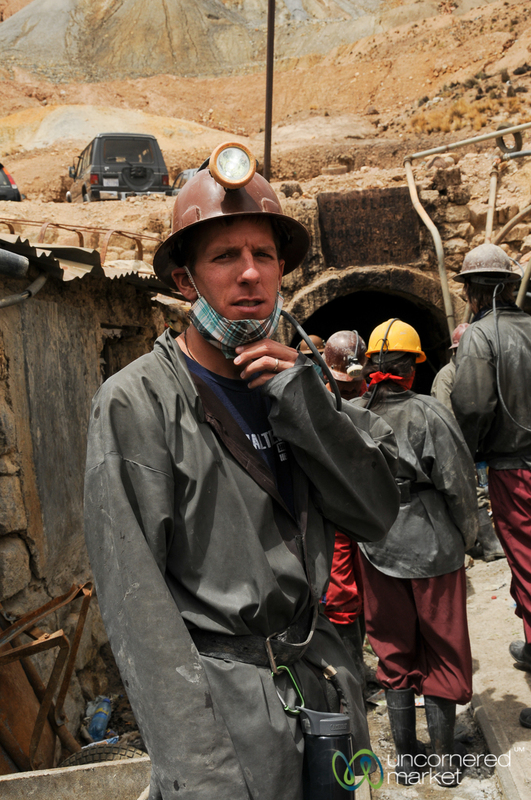 We’d been in the Cerro Rico mines in Potosi, Bolivia for a little over two hours. The scale of my discomfort in perspective: a boy of 12 whom we’d just met in one of the tunnels had ten hours left on his shift. I was reminded by what David, a guide and a former miner himself, had told us earlier, ”We eat the mountain... and the mountain eats us." The “mountain,” Cerro Rico, is always present in Potosi. 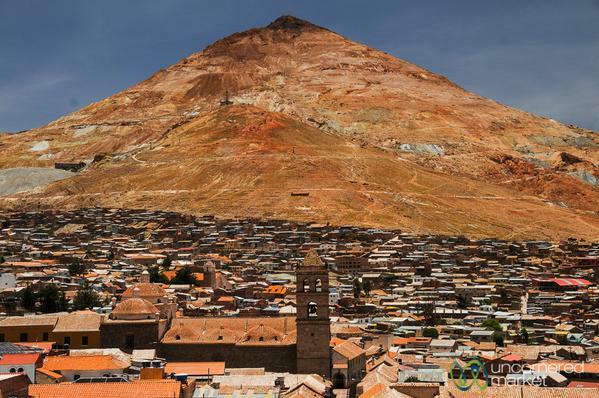 In the 16th and 17th centuries, this Bolivian city was one of world’s biggest and richest. Locals are proud to share that its wealth exceeded even Paris and London at the time. 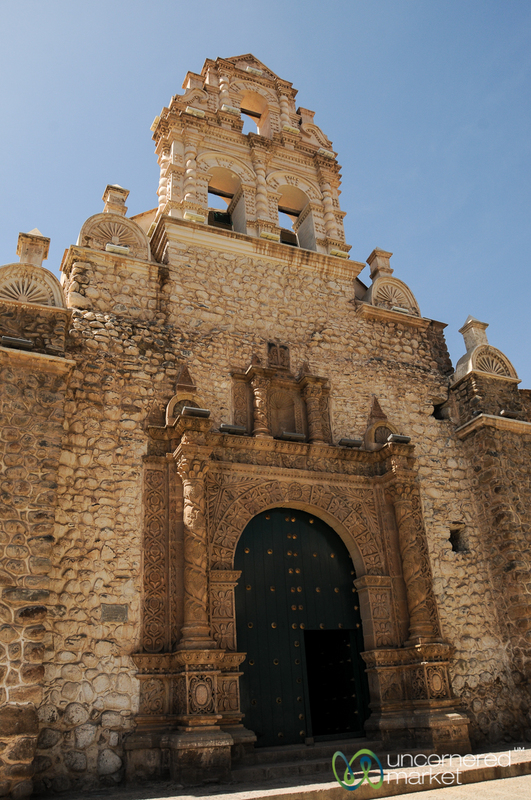 San Bernando, one of the many colonial churches in Potosi. A scan of adobe mud homes and the rusting machinery laid out at an altitude of 4,090m (16,100 ft) makes this history a little hard to believe. If you check the books, though, you’ll see it’s true. At its productive apex, Potosi's Cerro Rico mine churned out enough silver to account for half the world's supply, making it almost single-handedly responsible for funding Spain's expansion in Latin America. Mining in all stages at Cerro Rico. Strolling around colonial downtown Potosi earlier that day, we caught a hint of the town’s previous riches in La Casa de la Moneda (House of Money), with its baroque churches, ornate balconies and other remnants of colonial splendor. The vast wealth did not benefit the masses. Nor, did it come without exacting a great price: an estimated mind-boggling 8 million people, many of whom were indigenous or enslaved peoples from Africa, are estimated to have died in the mines. Both literally and figuratively, the mountain and mines of Cerro Rico loom over the city; it feels impossible to escape their shadow. Even though so much has changed above ground during the last five hundred years, not much has changed below. 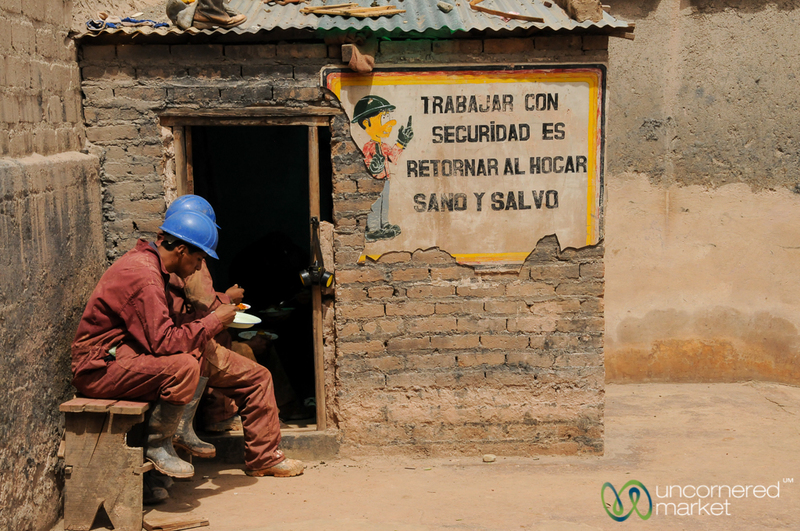 Although Cerro Rico miners no longer die by the millions through mercury contact as they had in early colonial times, they still die young of silicosis (black lung), often between the ages of 35 and 45. As a visitor, it’s hard to wrap one’s head around this. Our guide, a former miner himself, explained: "Nothing can be done once you have this [silicosis]. Even the best hospitals in Europe can do nothing to cure it. We know we're going to die young, so we want to make the best of what we have and enjoy life. This is why the festivals and celebrations here are so important to us. We give everything we have." A miner halfway into his shift, cheeks filled with coca leaves. 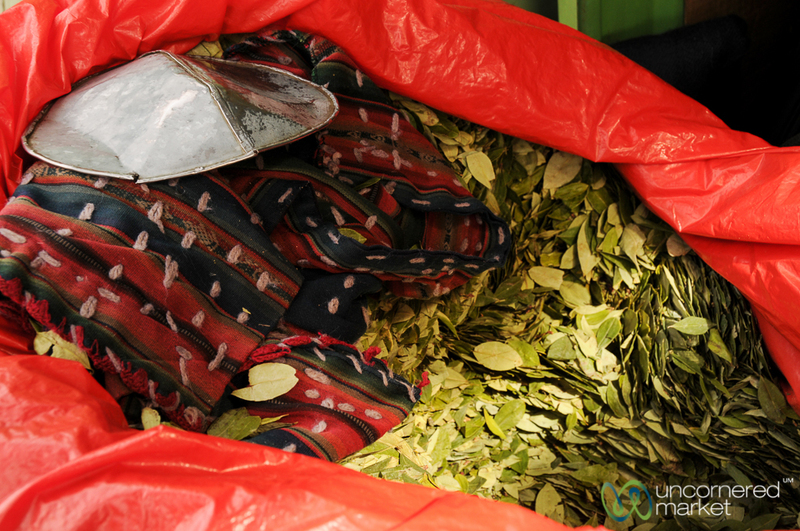 To make it through the workday, miners of every age fill their cheeks with large wads of coca leaves. The leaves give them energy; they curb hunger, too. 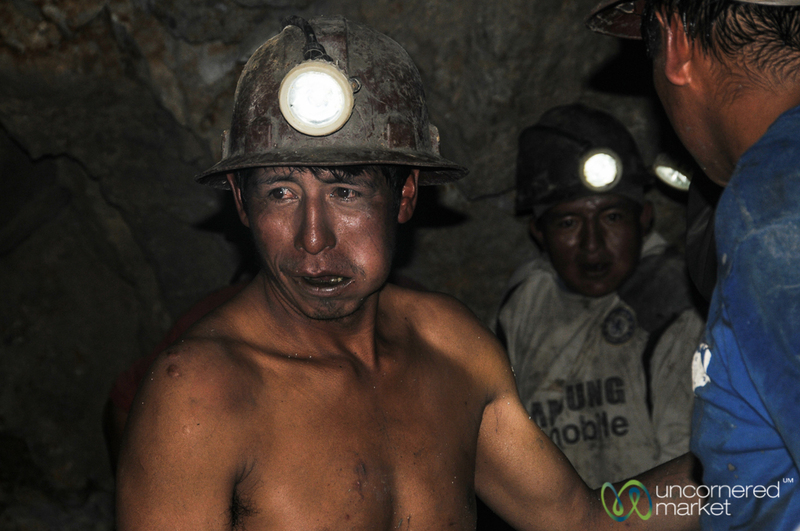 Deep in the tunnels, miners chew coca as if it’s their life force, just as their ancestors did more than 500 years ago. They accept gifts of coca leaves, soda and dynamite sticks from tourists visiting the mines. Many tour companies also give miners some money to compensate them for their time answering questions as it takes time away from their work. Miners are proud, though. They don't want to be pitied. In fact, as they tell it, that’s the last thing they want. 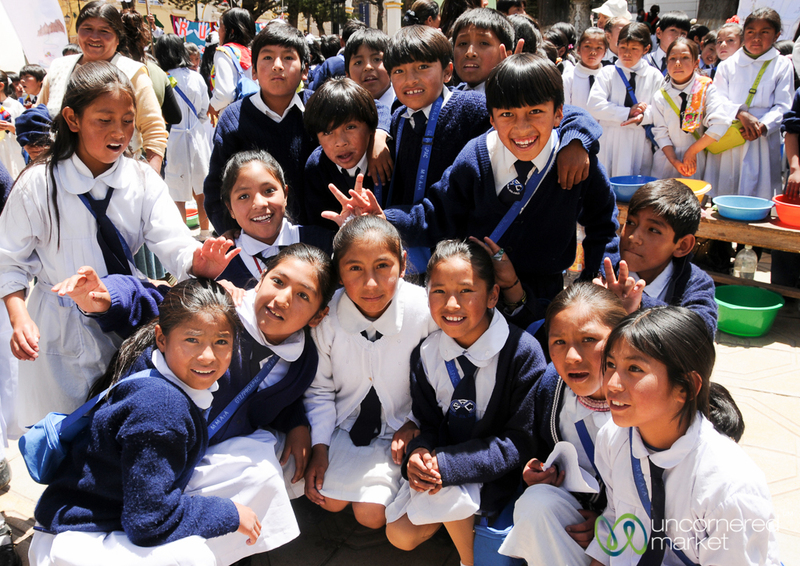 They work hard to honourably support their families, as the people in Potosi have done for centuries before them. What motivates the miners to keep going in the Potosi mines — to work long hours, to keep going into the hell of dust and heat of the mines, to risk an early death? The allure and possibility of striking it rich. Miners work in cooperatives, but the deal seems to be, should you find that once-in-a-lifetime vein of minerals, the riches are yours to keep. Pushing wagons filled with rock and rubble out of the mines. The materials then go to a processing centre where chemicals extract minerals. "There was once a miner earning only USD $80.00 per month, but one day he found a vein of silver. Today he is a millionaire and owns a fùtbol (soccer) team. The man we met outside? He bought 33 cars after he found a vein. After new veins of zinc were found in 2007, the numbers of Hummer automobiles in Potosi increased by 15. If you work as a truck driver, teacher or in the factories you can earn about USD $150.00 per month. Police technically earn USD $150.00 per month, but with all the bribes they take, it's much more. Same with politicians; they earn the most. But, we can't all be policemen or politicians. So, being a miner is the next best thing to support our families. There is always the chance to become rich if you work hard enough." Miners take a break for lunch outside. As much as we might wish circumstances were different, employment options in a place like Potosi are quite limited. The Potosi of the future? The day after our visit to the mines, we wandered through the streets of Potosi and ended up in the city’s main square. All around us were school kids minding displays for what seemed liked a city-sponsored week of handwashing awareness. A group of girls watched me for a while until they finally mustered the confidence to invite me to their stand. One by one, each girl stood tall and gave me a lesson on why and how to wash my hands, how to prevent dengue and yellow fever, and why clean water is a necessity for a healthy community. 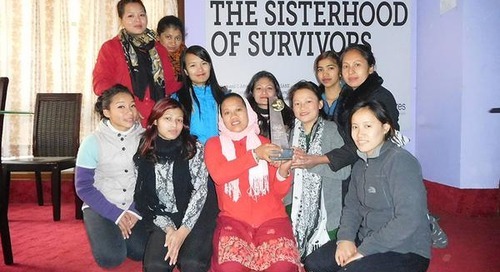 I loved the energy in their voices, and their proud and assertive body language. School kids proudly taking part in a handwashing and health campaign. Upon leaving the square, a group of excited 10–12-year-old boys from another school surrounded us. When they learned we were from the United States, they barraged us with a series of questions: "What is the White House like? Did you know Michael Jackson? Do you know Barack Obama?" In this short interlude, my spirit lifted. My hope is that this represents the Potosi of the future. As with any tour that features a real-time view of difficult circumstances and humanity, tour detractors argue that the experience amounts to paying to watch people suffer. We believe the value of the experience (for you, the miners, etc.) depends on how you approach the tour. 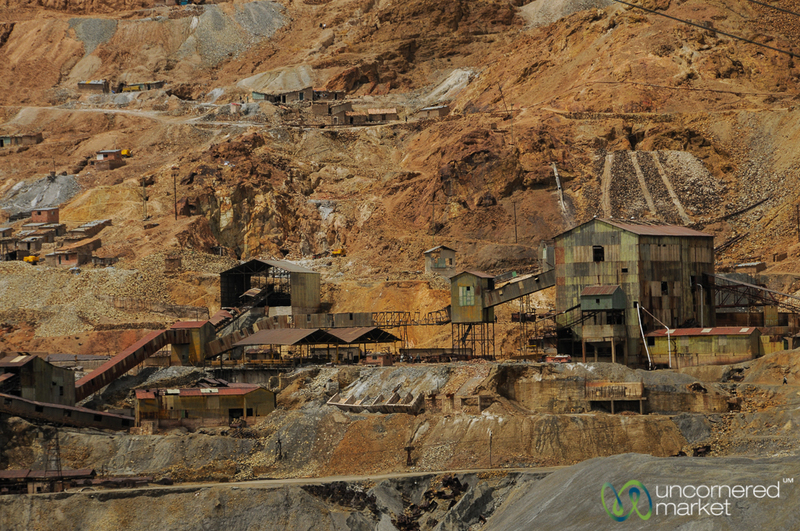 If you view the miners as you would animals in a zoo, then we advise you not to go and instead stick to Potosi city centre. If, on the other hand, you understand that the people you’ll meet in the mines are human and are proudly working to support their families the best way they know how, then the tour will be worthwhile. You’ll have an opportunity to understand mining life in a way that no film or video experience can deliver. You’ll never consume a story about mines and the miners who work them in the same way again. If possible, choose a tour where your guide is a former miner. He will be able to explain mine process and machinery, as well as the psychology and circumstances of mine workers. In addition to all the protective gear that the mine tour will give you (jacket, hard hat, flashlight), we also recommend that you buy a bandana, soak it in water and put this over your mouth and nose just before you enter the mine. We also added a facemask on top of our bandanas. This will serve to catch some additional dust and sediment, hopefully making it easier and cleaner for you to breathe. All geared up in protective gear and facemask to go into the mines. Most tours give some of the proceeds of mine tours to the miners to compensate for the fact that tours and tourists take place in their workspace. Additionally, many tours will stop at the shops outside of the mines so you can pick up gifts for the miners (dynamite, coca leaves, soda, etc.) before you enter. It’s a nice gesture, as these are all practical things they use every day. Coca leaves, one of the miners’ staples. We recommend that you watch the film Devil’s Miner before or after you take your mine tour. Many of the hotels and guesthouses in Potosi show it regularly. It’s a terrific documentary told almost exclusively in the voice of a young boy who works in the mines to support his family. It brings an even greater understanding and perspective to the experiences you will have on your Potosi mine tour. G Adventures runs a number of departures inBolivia encompassing a wide range of departure dates and activities to cater to different tastes. We’re thrilled at the prospect of showing you this big blue planet of ours — check out our small group trips here. Join us at the end of the Earth in Ushuaia, the southern South American city sandwiched between the elements.